Since 2010, The Feinstein International Center has provided advisory support to the Darfur Development and Reconstruction Agency (DDRA), a national NGO in Sudan, to set up and manage a community-based market monitoring network in the Darfur Region: the Market Monitoring and Trade Analysis project (MMTA). The goals of the MMTA are: to deepen analysis and understanding of the shifting patterns of trade and markets in Darfur on an ongoing basis for key agricultural and livestock commodities; identify how livelihoods and the economy can be supported through trade; and identify peace-building opportunities through trade. The MMTA is comprised of a unique and powerful network of almost 50 community-based organizations (CBOs) that work collaboratively across all five Darfur states to monitor and analyze trade flows and market activity. With this strong local base, the data collection and its interpretation are rooted in local knowledge and understanding. Despite the challenges of working in a context of protracted conflict, the MMTA monitors more than 70 markets across Darfur. They produce a variety of different outputs for a range of users from state and federal government to international and national aid agencies. This project started in 2010 as part of a major four year research project on Pastoralism, Trade and Markets, which was part of the UNEP Sudan Integrated Environment Project funded by UKAid, from the Department for International Development. More information about that project is available here. Carrying out in-depth studies into the trade in Darfur in livestock, cash crops, and cereals. These studies have been led by Feinstein, working in partnership with DDRA. The implementation of the MMTA has been funded by the European Union through SOS Sahel International UK, and by UKAID from the Department of International Development through UNEP. Feinstein’s advisory support has been funded by DFID through UNEP and the Building Resilience and Adaptation to Climate Extremes and Disasters (BRACED) project, and UNDP. This study on the trade of onions and tomatoes in Darfur explores trends in the production of and trade in onions and tomatoes during the conflict years, and the extent to which this is an area of current and potential growth. 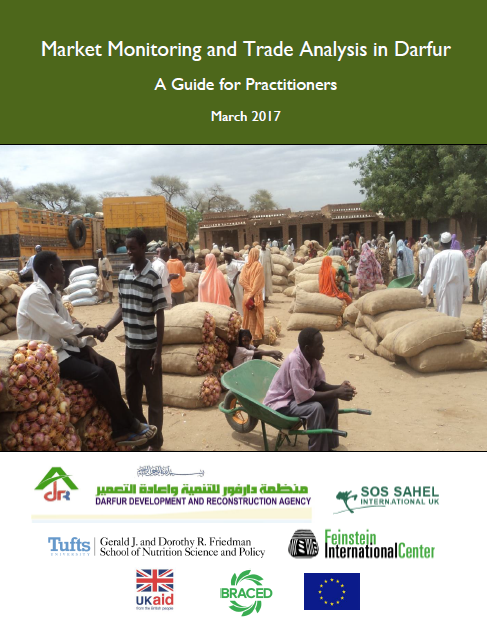 This guide documents the experience of the MMTA project in Darfur. It captures and codifies good practices that were used to fulfill the mandate of the MMTA and offers learning from what has worked and from challenges the project encountered over a six-year period. As a resource for those involved in market monitoring in Darfur and elsewhere in Sudan. To share the MMTA approach with organizations and networks involved in market monitoring and market assessments internationally, recognizing that on-going systems of market monitoring have received relatively little investment and have often been a struggle to maintain, especially in contexts of protracted conflict. Launch Workshop Report: This is a report of the first training workshop for DDRA and community-based organizations. The workshop introduced the project and laid the foundation for the MMTA’s work in North Darfur. It was held in El Fasher in October 2010 and was designed and supported by Feinstein. MMTA Workshop Report: West Darfur This report is of a training workshop for community-based organizations, local non-government organizations and other partners during which the MMTA activities in West Darfur were set up. It was held in El Geneina in 2012 and was designed and supported by Feinstein. The report provides insight into the ongoing training and capacity building of the market monitoring network.